Welcome to Episode #02 of the Living Homegrown Podcast! 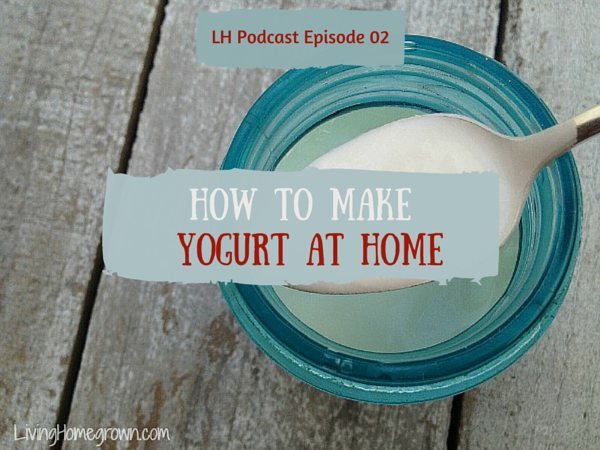 This episode is all about making yogurt at home with an emphasis on doing it the EASY way. * Most cultures can be reused to make a new batch of yogurt except for direct set yogurts. They are one time use products. Note: All of the cultures listed above are from Cultures for Health. I am not an affiliate for them and I have no connections with them other than as a customer. I just love their products and wanted to share them as a resource. But there are many other places on the internet where you can buy yogurt cultures if they do not have what you are looking for. Do you have a question you’d like to see answered on a future podcast episode? You can ask your questions over on my Ask Theresa Page. Your input there will direct impact what I cover on this podcast, my blog and even our TV show – so please let me know what topics you would like to see covered. Thanks for this helpful information! You are so organized and have a very good voice, too!! Hello Theresa, I have been following you from podcast 00, and love the show. I have tried the yogurt recipe and it has turned out wonderful! I am on my six batch from the first culture and it is still going strong! The taste is great, I always have some on hand and it has saved me money and kept me feeling great. Thank you for tips like this and keep up the good work! I just discovered your site and I am completely hooked on your podcasts. I think I’ve gone through most of them. I cannot wait to try your yogurt recipe. I do have a question. According to my research, you should not can pasta. Why? There are plenty of commercially canned products containing pasta (spaghetti, raviolli, chicken noodle soup, etc. ), however it is not recommended for the home canner. I would love to can chicken noodle soup. I currently garden and can & freeze nearly all our vegetables & fruit. We raise chickens (for both meat and eggs), have a private fish stock, and also milk goats (for cheese and butter). I make all our baked goods including bread, rolls, noodles, cookies, etc. Our goats are Nigerian Dwarf breed. Among the goat breeds, they produce one of the highest butterfat contents (at 6-10%). I am anxious to try making your yogurt recipe with this milk. The milk is excellent, so I’m anticipating the yogurt will be over top. So excited to try the countertop method! Do you have another source you would recommend for purchasing the starter heirloom culture? It looks like Cultures for Health only sells them in a multi-pack right now, and I’d love to just purchase the individual culture. Thanks! I would like to make some pickled beets. My mother made them when l was young and the family was crazy for them. Unfortunately all of the recipes l have found call for a lot of sugar and l am diabetic. Can l substitute a product like Splenda for the sugar?